My abdomen is mending, so I’m going to start taking the stairs again. You should, too! I work on the second floor of a building equipped with elevators. The elevators are right off the lobby, so it’s so easy to walk in, say hello to the security guard, and glide into an elevator. You have to walk halfway through the building to get to either set of stairs. Out of sight, out of mind. Even though the elevators are prone to malfunction, and my coworkers and I are pretty sure they’re going to eat us one day, force of habit over many years led me to take them all the time, whether my knee hurt or not. The elevators are frequently taken out of service for maintenance. I wonder why that is? Could it be… could it be all the bones? Back when I was 40 pounds heavier, walking up stairs sucked, because my knee was under more pressure and more prone to hurting. I’m so glad that my doctor’s food lifestyle change has worked out for me as well as it has, because I kind of missed stairs, which sounds weird, I KNOW. My grandma’s house, where I grew up, had stairs that went straight up, then wound back in a semicircle, and when I was a kid, I’d take them two at a time once my legs were long enough, playing counting games and trying not to touch the floor 13 times on my way up. What can I say, we didn’t always have a Nintendo. I started taking the stairs for a challenge on the Slimkicker app a couple of months ago. Good for points, and good for my body, and once I got into the habit, it was so easy. I only walked up a flight of stairs a couple of times a day, but since I do such little cardio otherwise, I got a lot of benefit from it. Plus, the back exit of the building leads to a decorative tree area where I can walk out into a bit of nature to defrost from the frozen tundra that is my office during the warm months. 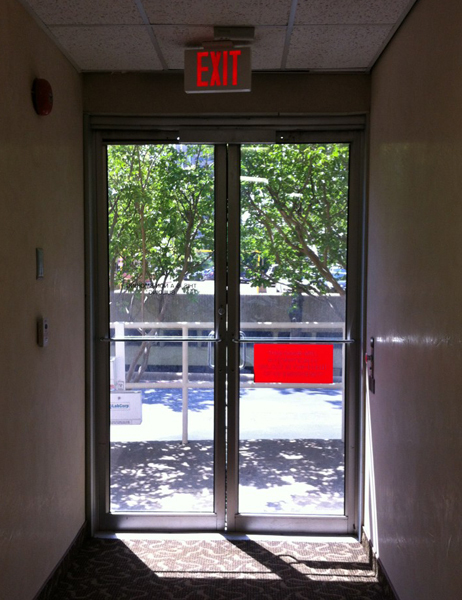 Exit near the stairs – portal to a few minutes of lunch respite, or to the end of my work day. Since I stopped taking the stairs, I’ve not replaced it with any other form of exercise, and I have begun snoring again. I can’t help but think the two are related. When your knee is borked, do you want to take the stairs? Understandably, no. When your abdomen is healing from surgery or from torn scar tissue, do you want to take the stairs? No, no, no. Ack. Related question: do you want to just never move again and never test your body’s healing process, just opting out of using body parts as they break down, and get less and less fit? Um… no? I guess not? I remember doing my favorite pilates workout for the first time several months after my 2010 gallbladder surgery. I don’t know if my discomfort was more physical, stretching muscles that had healed but hadn’t really been worked very hard, or mental, thinking about what could go wrong, imagining worst-case scenarios, as I’m apt to do. I got through it, though, with the thought that hell, I did a fundraiser walk two months after going under the knife, why am I afraid of twisting around on a mat on the floor? Your body heals and rebuilds itself if you feed it properly and if everything is working correctly on a chemical level. The hardest aspect of restarting a workout routine after you’ve had a surgery or an injury is mental, and there are two sides of the same coin: overdoing it too quickly because you think you can do more than your body is capable of handling, and you wind up reinjuring yourself, or you are so afraid of experiencing that pain again, of aggravating the soreness of a sore spot, that you avoid exerting it at all. There’s a middle ground to be found through both listening to your body and having the courage to try, no matter what you’ve been through. With that in mind, I think it’s a bit too soon to get out my mat and throw on my favorite pilates DVD. My healing abdomen needs another few weeks, occasional twinges of pain reminding me that I’m still knitting back together. In the meantime, I have vowed to take the stairs – slowly and carefully – as often as possible, unless my body tells me to take the elevator and ice down my abdomen. So: being more cardiovascularly active, potentially improving my snoring, strengthening my leg muscles for walking or running endeavors, and using those abdominal muscles – benefits of the free mini-workout my office makes available every morning, if I’d just make myself get back into that habit. Better than trusting my body to the man-eating elevators. This entry was posted in fitness, health and tagged cartoon, Exercise, fitness, goals, habit, health, injury, physical therapy, Rehabilitation, snoring, workout wednesday. Bookmark the permalink.